Over the years, I've seen quite a few resin busts and one thing I can say is that the quality of the work seems to get better and better as time goes on. This one is no exception. 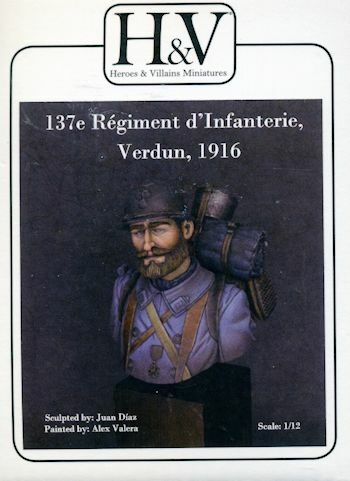 It is a bust of a solider of the 37th Infantry Regiment during the bloody fighting at Verdun during 1916. The quality of the casting is superlative. It is so well done that there are no mold seams and only one tiny resin pour stub to remove, and that is on the section of strap you see in the upper middle of the picture. This piece goes on the opposite side of the pack. The shininess is probably due to mold release material so it is a good idea to wash these parts in warm, soapy water to remove that. Other than that, this one is ready to assemble and paint. The fit of the parts is very good. One only needs to perhaps primer things and start painting. 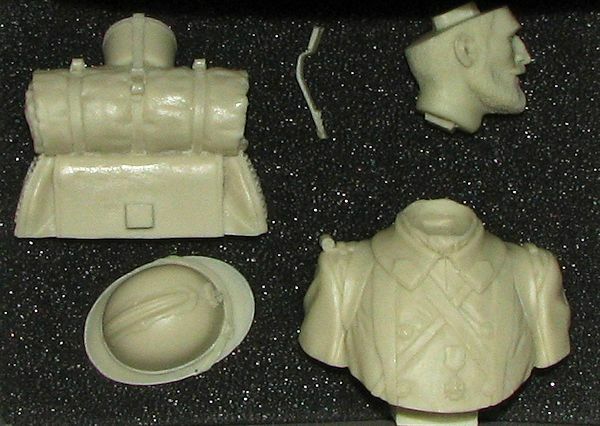 The box top provides a color photo of the completed figure to use as a guide. Best of all, this kit is not expensive and would be a great way to get started with resin figures. Thanks to High Calibre Miniatures where you can get this set from this link.